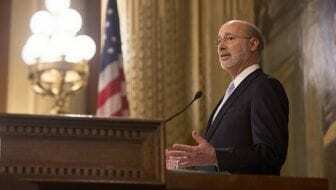 (Harrisburg) — The start of a term two is imminent for Democratic Governor Tom Wolf. He’s being sworn in Tuesday in a day-long series of events. The day will be capped with a celebration at the Pennsylvania Farm Show, featuring PA-made food and drinks, Philadelphia’s own the Roots, and a whole bunch of sports mascots—though the Flyers’ infamous Gritty is apparently skipping the event. But before that can all start, the official stuff has to happen. A spokesperson said that in Wolf’s inaugural speech, he is expected to focus on bipartisan cooperation and restoring public trust in government. The governor has indicated that in his coming term, he plans to renew efforts to pass a higher minimum wage and natural gas severance tax, among other things. Those are both priorities that didn’t get much traction in the last four years. Wolf’s first term was marked by budget battles, incremental progress towards a less-punitive criminal justice system, legal medical marijuana, more widely-available booze, and lot of head-butting between himself and the Republican-controlled legislature. The inauguration will also be former Braddock mayor and new lieutenant governor John Fetterman’s introduction to Harrisburg. Fetterman will preside over the Senate and chair the Board of Pardons.